Police and firefighters responded to the flammable materials storage chemical plant explosion. Emergency teams stated the the situation has regained control and is being handled cautiously. The chemical plant explosion occurred Tuesday morning, August 27, 2013 at a BASF chemical plant in Cornwall, Ontario. Chemical Storage Units by US Chemical Storage. Officials stated there were no immediate injuries. Homes nearby stated that the chemical explosion shook windows and attachments to their house. This chemical plant in particular, manufactures monomeric and polymeric plasticizers. It is still being investigated to what caused the flammable materials storage chemical plant explosion. The investigation is ongoing, but officials stated that a storage tank was over pressurized and finally exploded. The plant was shutdown and closed to the 30 employees that work at BASF. 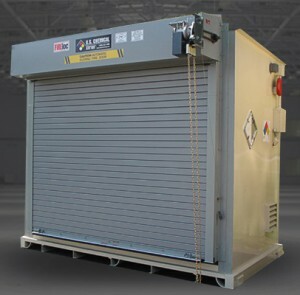 Offering the strongest and most reliable flammable storage containers. US Chemical Storage flammable containers are designed to keep any type of flammable safe and compliant. Our FIRELoc chemical storage containers offer you with the assurance needed for storing flammable materials. Keeping flammable materials storage compliant is a necessity and can be the determinant for hazardous situations. Chemical explosions and chemical blasts can be prevented with our customizable accessories.